I smoked my first cigarette when I was fourteen years old. Sorry, Mom. It was more of a hey-look-I'm-cool-and-everyone-else-is-doing-it phase. Nothing really became of it. I'll have you know that after that day of poor judgment, I never picked up another cigarette. They are disgusting. Gross. Stinky. Deadly. Addicting. Shall I go on? Yeah. Swallow those numbers for a moment. $8.8 billion dollars. Do you know how much local schools could do with that money? What about all the potholes on the highway...feeding the homeless...making this country a bit more safe? Now, talk about something leaving a nasty taste in your mouth. That's an awful lot of money being spent to target and market cigarettes to MY kid, YOUR kid, OUR kids. This senseless hits closer to how when I examined the statistics for my homestate of Maryland. 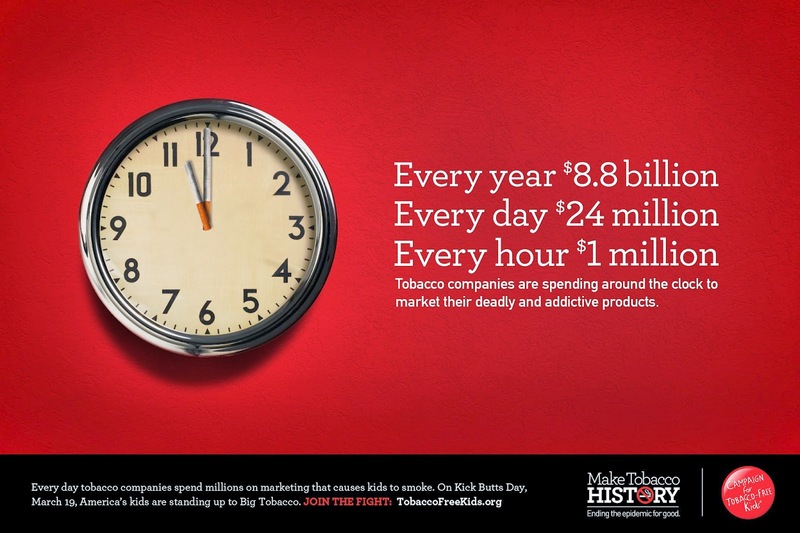 Tobacco companies spend. $120.2 million on marketing efforts in Maryland. In particular, tobacco companies target youth with magazine ads, store ads and discounts, and fruit- and candy-flavored small cigars that look just like cigarettes. In Maryland, 12.5 percent of high school students smoke and 4,200 kids become new daily smokers each year. Nationally, 18.1 percent of high school students still smoke. So, what can we do about it? Well, we can KICK BUTTS, that's what! This Wednesday, March 19 is the Campaign for Tobacco Free Kids Kick Butts Day! "Kids in Maryland will join thousands of young people nationwide for the 19th annual Kick Butts Day. 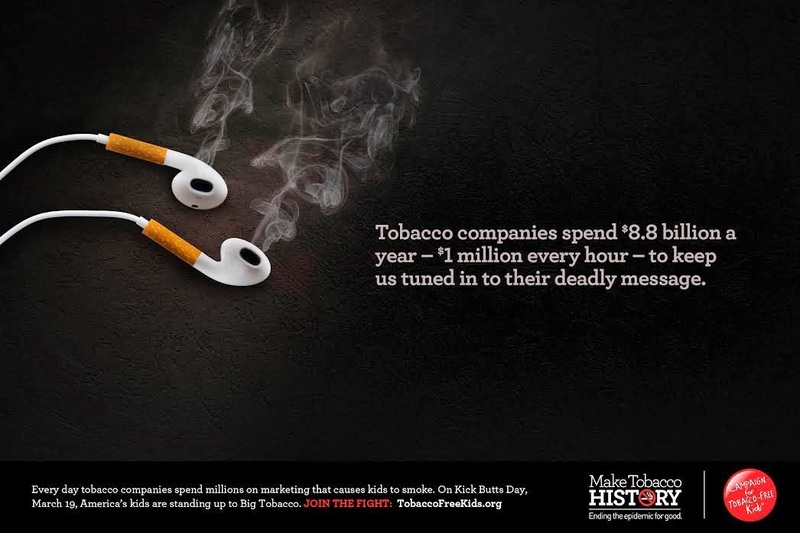 They will demand that tobacco companies stop marketing to them and encourage elected officials to do more to protect them from these lethal products." Now is your chance to spread the word, get in on the action and take a stand. Across the country, there are events being organized to fight back against the tobacco company. For instance, CVS (#StandWithCVS) has banned the sale of tobacco products starting later this year. Did you know that this year marks the 50th anniversary of the first Surgeon General’s Report on Smoking and Health? A new Surgeon General's report reveals that smoking is "even more hazardous than previously thought." As if you needed any more reason to protect our children, reading information like this makes me wonder how tobacco companies aren't deemed murderers when they knowingly flood the market with a product that kills. Scary! Before I sign off, I'll leave you with this – 92,000 Maryland Kids alive today will die prematurely from smoking. 92,000! My heart bleeds just thinking about this number. Please, for the love of our children, STOP already! For a full list of Kick Butts Day events in Maryland and other states, visit http://www.kickbuttsday.org/map . This is a sponsored post. I was compensated for my time. The opinions and views are my own.